During the recent Festival de la Plaisance in Cannes, Simpson Marine, a Chinese company, hosted more than 200 guests onboard its 122-m "Alexander". 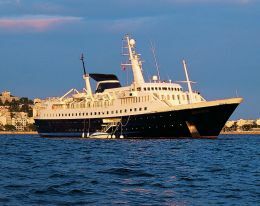 This famous motor vessel has hosted many VIPs, such as the English royal family. The event was organised by Simpson Marine, a company set up by Mike Simpson in Hong Kong in 1984 and now operating in Malaysia, Thailand, the Philippines, Singapore, Taiwan and Monaco. For further information: Simpson Marine; Tel. 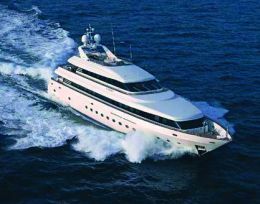 +377 97982828; Web site - www.simpsonmarine.com; e-mail - monaco@simpsonmarine.com. 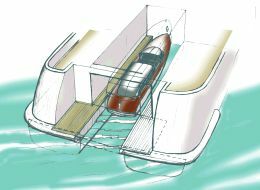 "Aruba Rest" is a project of the Sergio Abrami & Co. Yacht Designers studio for Boats & Watergames Italia. It involves the creation of a variable-displacement, underwater-view boat. The boat in question is a catamaran set up with a restaurant, bar, discotheque and other tourist services - with a unique touch. A transparent "floor" made of unbreakable glass providing a panorama view of the sea bottom. The "BW Cat 32 Aruba Rest", 32-m long and with a beam of more than 12 m, is able to accommodate approximately 300 passengers. The liquid-balance system means that there is an excellent view of the sea bottom both when the boat is anchored and when moving. A sophisticated lighting system provides night visibility. "Aruba Rest" also offers facilities for enjoying the water, such as the stern platform set up for bathing and two unique slides for diving. The saloon area has hideaway side- windows for airiness during summer months and protection from bad weather during the winter. Navigational safety is guaranteed by unusual backup buoyancy so that even if the glass bottom should break, there is no possibility of sinking. A second layer of unbreakable glass is further insurance against such an eventuality. Propulsion is provided by a pair of inboard motors with V-Drive transmission for a maximum speed of 18 knots. For further information: Boats & Watergames, Via Campagnola 5, 25010 Calcinato (BS); Tel. +39 030 9964357; Fax +39 030 963061; Web site - www.watergames.com; e-mail - info@watergames.com. Maurizio Magri has assumed the position of Sales Manager for the Cantieri Navali di Lavagna, an appointment which confirms the CNL Group's current phase of major expansion. It will soon open a new division, thanks to its excellent market performance with the Admiral brand. For further information: Cantieri Navali Lavagna, Via dei Devoto 197, 16033 Genoa; Tel. 0185 300341; Fax 0185 306601; Web site - www.cnl.it; e-mail - info@cnl.it. The Dutch builder Amels has designed a new tender-stowing system. As opposed to ordinary garages, the new system provides for an actual structural modification to the prow. On the basis of the new design, a hangar is created in the central part of the hull. The innovation has been given the name "Stash" (Single To Twin Aft Ship Hull) and is well adapted to the Dutch shipyard's new bottom designs. The shipyard has been researching new solutions for stowing tenders, which are increasingly large and increasingly numerous. "Stash" makes it possible to stow the tender in an area out of sight, thus ensuring a clean, aesthetic look to the superstructure without reducing the stern-platform area and yet remaining in conformity with certification bodies' construction criteria. 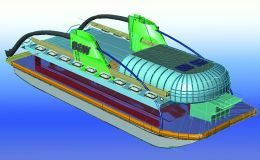 When this solution is used, the boat's stern area is divided into two hulls while the rest of the underbody retains its conventional shape. The tender is stowed through a stern opening. It is hoisted on board with a fixed lifting-system which eliminates the need for davits, after which both the transom hatch and the platform return to their original positions. Studies done at the Delft Technical University have confirmed the advantages of this revolutionary system. Above all, the catamaran configuration of the stern area guarantees greater stability with respect to the traditional shape and the cost of the hatches is less than that of transom hatches. According to Amels, this solution is ideal for boats over 70-m in length but it does not rule out the possibility of adopting the "Stash" to 40-m boats. Further information is available at the Amels Website, www.amels-holland.com. The Lauro.it Group has recently presented Seashuttle, a new division specialised in super-yacht chartering and owner services offered through the various Group companies, including MulstiService Group and the Marintecnica, Palombo and NauticaSud shipyards. The goal of the new division is to become a point of reference for owners sailing in southern Italy. This year, Seashuttle published its first "Luxury Yacht Charters" catalogue to promote its offer, which includes, in addition to charters, the handling of bureaucratic procedures relative to safety certifications and crew management, as well as maintenance and refitting. For further information, contact the Lauro.it Group through its Web site (www.lauro.it) or by telephone (+39 081 4972222).